I am a fan of Tim Prebble’s The Music of Sound, where he deals with field recording and the role of sound in general. Tim is running a field recording competition which requires ‘a cardboard box, a microphone, a recorder and you. Thats it! No processing allowed, submit a single take’. One (empty) box of Weet-Bix apricot bites. One JrF c-series contact microphone. Two pieces of masking tape. One USB cable to record in a mac air using Audacity. Two hundred (200) mealworm beetles (Tenebrio sp). 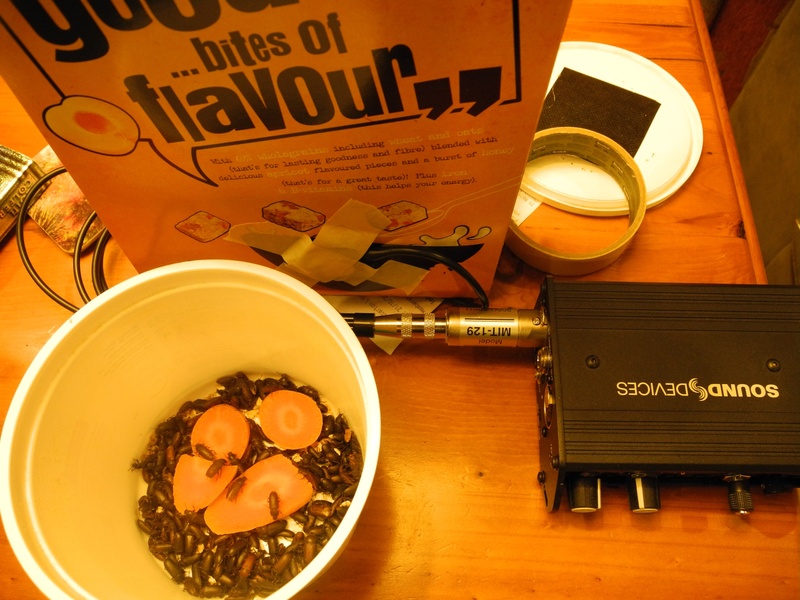 The photo shows the ingredients with the beetles having a dinner-break, while I was setting up a leaning box. I was pleased with the final result, although I would have liked a more full boxy sound. I’ll have to train the beetles to behave better in the box.